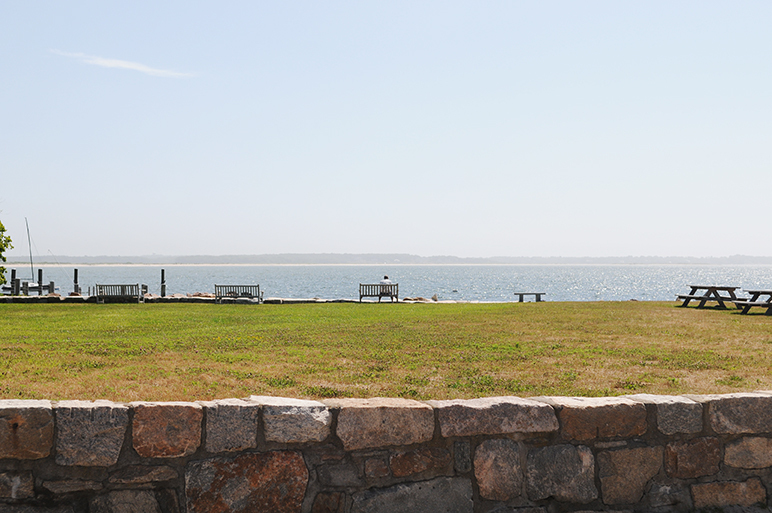 For a walk along scenic Stonington Harbor, pick up the paved path at the waterfront gazebo in front of Stonington Commons on Water Street (a large condo complex that includes an eatery and dock access). While there are many, one of Stonington's greatest advocates for conserving natural resources is the Avalonia Land Conservancy. 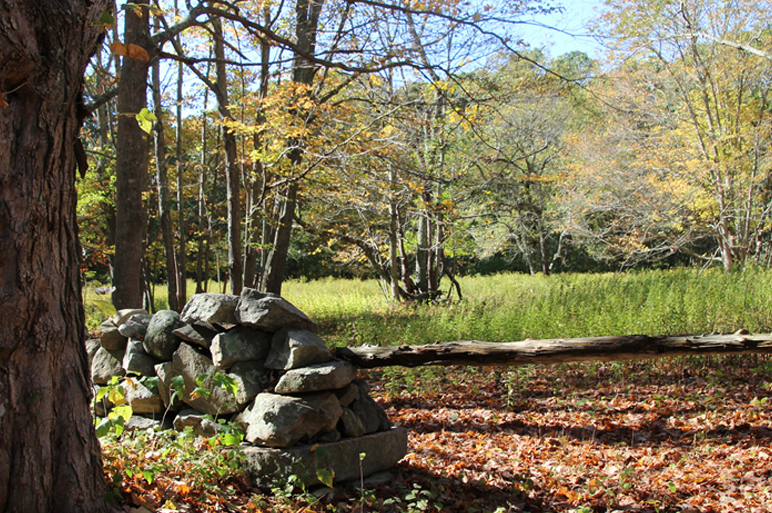 In and around Stonington Borough, you'll discover beautiful walking / hiking trails, preserves and natural wooded areas protected and maintained for passive enjoyment such as hiking, bird-watching, nature study and photography. For a full list of Avalonia's preserves and visitation guidelines, please visit the Avalonia Land Conservancy online. 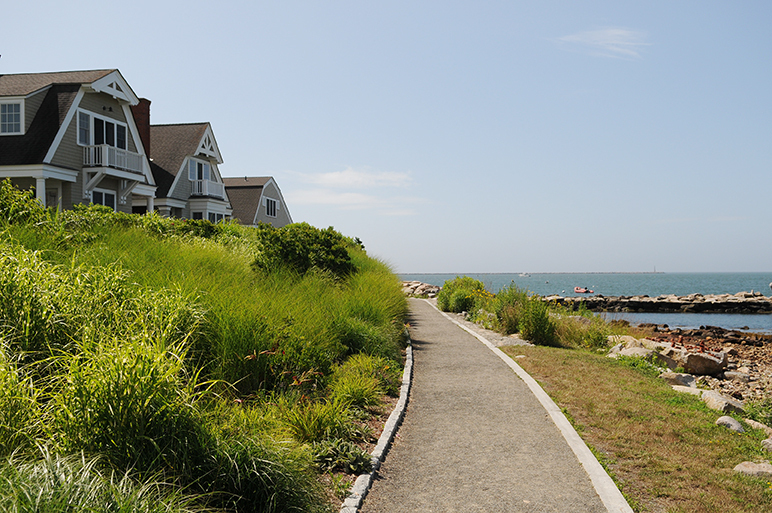 Dodge Paddock & Beal Preserve: Located at the end of Wall Street in the Borough, you'll find the loveliest walking trail on an open salt marsh meadow filled with wildflowers and beach roses, with panoramic views of Little Narragansett Bay. Fennerswood Preserve: Consists of 93.14 acres divided into five tracts of woodlands, forest, swamp and wetlands. You'll find the trailhead for the 26 accessible acres of Fennerswood West Tract on North Main Street. 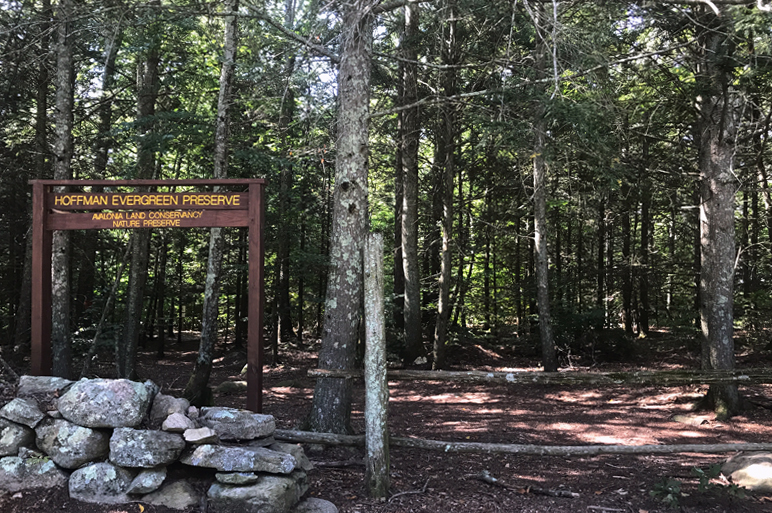 Hoffman Evergreen Preserve: Approximately 2 miles north of CT Route 184 on Route 201, you'll find an extensive trail network on 200 acres that winds through a mixed evergreen and hardwood forest with some wetlands, stone walls and an ancient cemetery. Knox Family Farm: Accessible by a trail or by water, Knox Family Farm consists of 26.78 acres with approximately 1 mile of trails. The area is wooded with a kettle hole pond, boulder moraine and frontage on east side of upper Quiambaug Cove. Knox Preserve: This trail is short but sweet — approximately .5 miles — former farmland with old orchards, stone walls and a small pond. Bird lovers may see purple martins, but check your calendar - fields are closed during bird nesting season (April 1 - August 15). The ocean-side abuts the Miner Cemetery — the oldest in Stonington. Paffard Woods: Located on the west side of North Main Street, this preserve offers approximately 1 mile of diverse terrain including a heavily wooded glacial valley, a salt marsh on a tidal cove, large trees, a white pine grove, hayfield and wetlands with foot bridges. Pequotsepos Brook Preserve: This is part of a trail system and larger greenway of additional lands held by the Denison Society and the Pequotsepos Nature Center. The property protects the Pequotsepos Brook and contains an old quarry, historic stone bridges, an upland hardwood forest, small fields, wetland pockets and vernal pools. Sandy Point Nature Preserve: Accessible by water only, Sandy Point is surrounded by shifting sand bars. It is a major spawning ground for horseshoe crabs and hosts nesting American Oystercatchers, Piping Plovers and Least Terns - all protected species. Permits are required during the summer and are obtained through the Stonington Community Center. Simmons Preserve: For a short but beautiful stroll, visit this small meadow on a salt marsh at the edge of Quanaduck Cove. 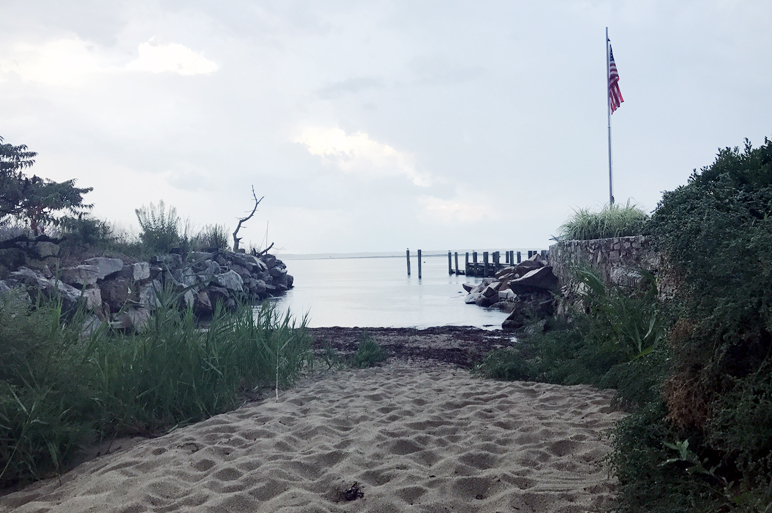 Accessed by the water or the small white gates on North Main Street, you'll find beach roses, marsh plants, ancient gnarled blueberry bushes and evidence of the wildlife that inhabits the area. At the tip of Stonington Borough lies Stonington Point, duBois Beach and East Lawn with picnic tables and benches where you can sit and watch the sunset or borrow a book from the Little Free Library for the beach — provided by donors to the SVIA, maintained by the Stonington Free Library and built by the Stonington High School shop class. Located on Front Street next to the Town Dock, the Stonington Borough Playground is a fenced-in play area with lots of equipment to keep the kids happy. It's well maintained (and recently revamped by the SVIA) with benches, a small pavilion for shade and great views of the fishing docks. If you're there on a Saturday May through October, don't miss the farmer's market nearby on the green. Mathews Park is a hidden gem surrounded by 4' high hedges with a grassy lawn, gardens and picnic tables. Maintained by the Stonington Village Improvement Association, it's located at the northernmost point of Water Street, directly across from Dodson Boatyard (behind the main parking lot). An ice-cream social is held each July 4th after the town parade. The Stonington Free Library sits in the center of Wadawanuck Square, a beautiful park with old-growth trees and lots of benches and shady spots to have a picnic. Located at 20 High Street, just over the bridge when you enter the Borough. In 1975, Admiral James Fife, Jr.'s estate at 571 Stonington Road was bequeathed to the SUBASE New London for recreational purposes. It's a beautiful 40 acre property with a two acre pond, a large pavilion, a softball field, volleyball court, half-court basketball, playground, horseshoe pits, hiking trails, catch and release fishing and restrooms. Admiral Fife Recreation Area is open to April through October daily from 8 am to sunset. If you have SUBASE access, reservations can be made in-person at the SUBASE swimming pool in New London. At the end of Diving Street where it meets Hancox, there's a launching ramp for kayaks and a quiet place to swim. Locals also go there for the seaweed that washes up on the small beach - perhaps that's the secret to the beautiful gardens of the Borough? Nestled along the protective shores of Lambert's Cove just across from the Captain Nathaniel B. Palmer House, you'll find Don's Dock Marina which provides slips and services for small boats. Parking and lockers are available. The Stonington Small Boat Association, located in the heart of the Borough, was organized over forty years ago to provide boat storage and water access to Stonington Harbor by the Town Docks (4 Cross Street). There is a public launching ramp for small sailboats and unpowered vessels. Racks are available for dinghies and kayaks. Just beyond the parking lot off of Church Street, you'll find Wayland's Wharf — the Borough's public pier — with a grassy lawn, benches, gazebo, a dock with a ladder and direct access to Stonington Harbor. Small vessels use the dock for pick up and drop offs, and there's no pass or fee required. Locals know it's a great place to swim too.